This will open the Import Flat File Introduction page providing an overview of the features and showing what needs to be specified in order to successfully import data from a flat file to a SQL Server database. “An error occurred while running learn on the input file. By default, the name of the table in the New table name box will be the name of the imported .csv/.txt file (ImportData). The name of the table in which will be imported data can be changed and set whatever is liked as long as the SQL Server table and column naming conventions are followed. This page generates a preview of data that are located in the ImportData.csv file and how they will look like when are generated into a table. The Preview Data page generates max up to first 50 rows. 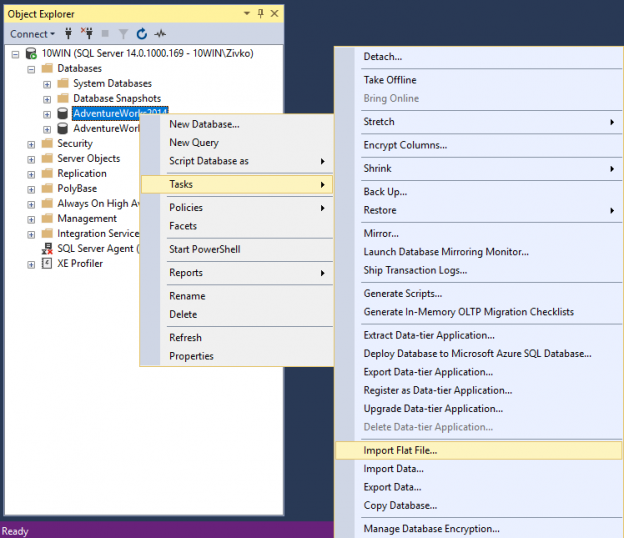 This page shows the names of SQL Server, database and the name of the table where will data from the imported .csv file be stored. Click the Finish button to import data formImpotData.csv file to the ImportData SQL Server table.